Natural Causes present several performance faces. One is a completely acoustic set for performances in small intimate venues. This has come about: as a way to play in cafe spaces; as a way to express material in a different format; as a way to prolong our health and; to reduce our band carbon emissions (e.g. arriving by public transport). Natural Causes metamorphise happily from one to the other, the material alters and the audience listen in a different way. electric world In our (so far) more usual electric band, the line up is (mainly) Hugh on Fender Rhodes piano, Pat on electric bass and guitar and Ben on full drumkit. Chris remains predominantly on trumpet in both forms of the band. We also always use french horn, melodicas and harmonium in both. acoustic world Ben plays a v. small drumkit (standing) Hugh plays accordion and guitar, Pat plays more clarinet than usual and acoustic bass guitar (this really forces the audience to listen) and we play more with the environment (tea-cups, radiators, newspapers…). Our vocals change in quality in a completely acoustic setting, responding to each other in a very organic way and engaging with the audience in a different way. 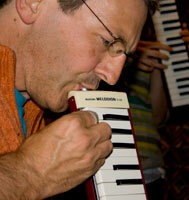 We create instant songs with them, give out instruments more readily (swanee whistles) and banter. Hugh composed music for Faulty Optic films in the performance piece ‘Soiled’. They also collaborated together on an Opera North commission called ‘The Wax Inspector’ involving film, live performance and musicians. Natural Causes have been playing live to these films in the last two years. They improvise to ‘Soiled’ and play a set of four songs (including ‘The Inspector Comes’ and ‘Waxworks’) composed by Hugh. NC have been exploring other films to play along to live, including ones made by Bamforths (from Holmfirth, Faulty Optics home) including ‘Kiss In The Tunnel’ (1899) and ‘Nailing Women’s Skirts To A Fence’ (1900). Most recently they have worked on Maya Deren’s ‘At Land’(1944). This experimental film has found a live soundtrack consisting of songs Hugh has written based on Jackie Kay’s words. NC have performed films at The Blue Walnut (Torquay), The Barn (Dartington), Nuffield Theatre (Lancaster), Bar 120 (Huddersfield) and The Barbican (Plymouth) and is hoping to tour them more extensively soon. Hugh is always composing songs. Sometimes they fit the NC coat, although it is never clear which ones will until they are tried out. Some songs from Nankivell’s Optet are re-visited (Curve of the Earth and Gina). Instant songs based around the birth of new animals in Paignton Zoological Gardens (including Baby Black Rhino and A Camel, A Camel) are re-arranged by the band. Songs collectively written in workshop situations later become part of the band repertoire -*Jaws* from a primary school in Huddersfield on the Playing the Map project and My Garden from a primary school in South Devon as part of Whaletone Opera. Additionally songs that crop up unbidden of their own accord, Back Home and The Sea of Japan find their way into the flexible NC repertoire. Burst Faun Consequences Ben and Hugh have an approach to songwriting called ‘Burst Faun Consequences’. It was born out of necessity as they now live over 300 miles apart. The rules are very simple and bendable. Hugh (Ben) sends some material to Ben (Hugh) by email. This can be lyrics, melody, manuscript, ideas, thoughts. The other responds to this and adds material (lyrics, harmony, melody, arrangement, more ideas…) and returns it by email. This continues (maybe three or four exchanges) until they have a song, which is then arranged (sometimes radically transformed) by the band in rehearsal. They have a default of sending material to each other on the 10th and the 25th of each month in order to make sure that there is always traffic on the BFC highway.Songs created in this way for Natural Causes include Left Right Handing, Memorable Grid Reference and Wudup.